Good evening. It was shaping up to be a gloomy, Turbo Tax kind of a day until I read the last paragraph of the New York Times obituary for the writer Ivan Doig. A Doig quote sparkled at me like a shiny stone on a worn path — lasting brilliance in a notice of death. Like other prominent authors writing west of the Mississippi, Doig resisted the “Western writer” label often used by book reviewers and critics. Actually, there were other bright spots today. Cooper and I had company from Sara while I put my nose to the grindstone and got my taxes done. A neighbor gave me a good-looking leather chair. I chatted with other neighbors on the road home from a walk. And I got a homemade oatmeal cookie delivery from Santa Fe. 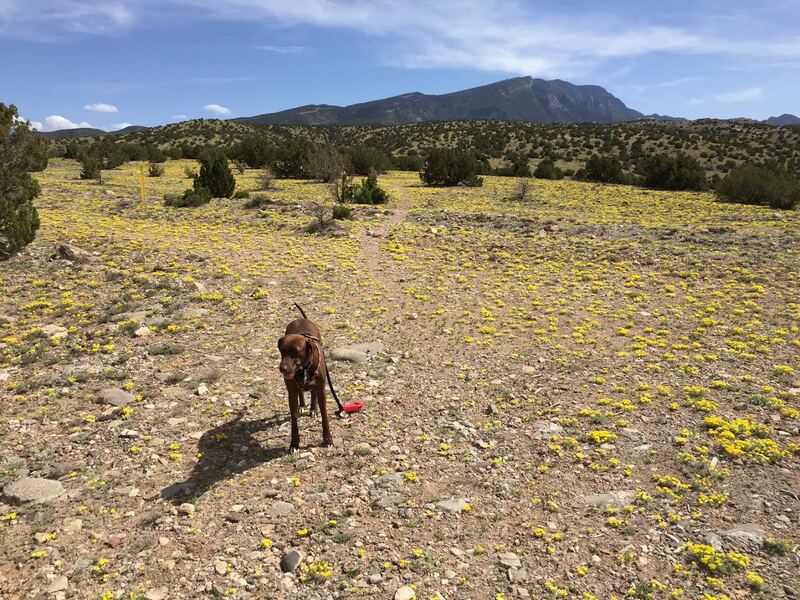 Here is Sara, by the way, in a photo by her owner, another neighbor, Lori, who managed to capture with her iPhone the yellow of the April fields of Fendler bladderpods that I can’t seem to get with mine.